Food explorer packs with expert-curated maps, and partners with award-winning locations that you actually get to collect something delicious at your own convenience. Jennifer Earle, the founder of Chocolate Ecstasy Tours, realised that not everyone was able to fit a tour into their schedule and she wanted to offer a way to help those people find the great places she knew. The idea also rose from what she would like when she visits a city - a trusted, curated list of places to visit and a reason to visit them, all in a beautiful package with fun facts and tips, that is excellent value. 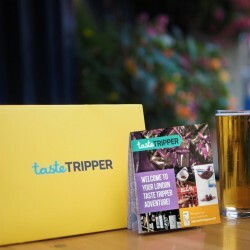 Taste Tripper food explorer packs are perfect whether you are a foreign or local foodie who loves chocolate or coffee or craft, artisan food and drink and love exploring the city on your own terms. 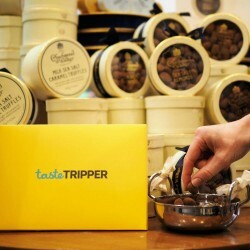 Taste Tripper were featured in Kaffeine and Good Things magazine. 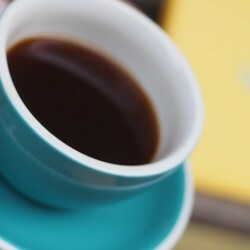 They work with many award-winning partners including Timberyard Coffee, Rococo Chocolates, Prufrock Coffee, Paul A Young Fine Chocolates.